Build on What You Know You have been learning about some of the people living in eastern Africa. You will now learn about the people of west, central, and southern Africa. ESSENTIAL QUESTION What were some of the environments that the people of west, central, and southern Africa had to adapt to? As the Sahara dried up, about 4000 B.C., people moved south into West Africa around the Niger River, just as they had moved eastward into the Nile valley. 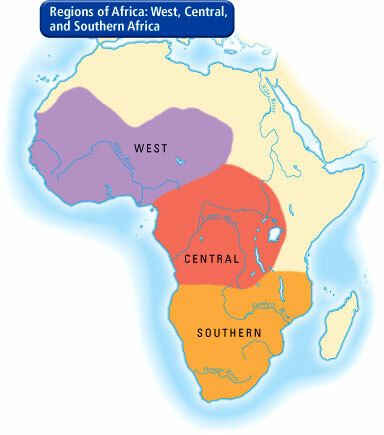 West, central, and southern Africa included savannahs (flat, grassy, mostly treeless plains) and rain forests. The rain forests in west and central Africa did not support much farming. People's lives there were very different from the settled lives of farmers in the Nile valley. Savannahs cover more than 40 percent of the African continent. They are mostly covered with grasses. Dry seasons alternate with rainy. These savannahs became the places where most people lived in small groups made up of a number of families. The Sahara has been expanding for thousands of years. This expansion of dry, desertlike conditions into fertile areas is called desertification. Normally, desertification results from nature's long-term climate cycles. However, as the illustrations show, human activity has sped up the process. Herding and Farming South of the Sahara, the savannahs were filled with herds of animals. Mainly because of climate change and also desertification, shown above, the soil was thin and not ideal for farming. As a result, many people were herders. These people kept cattle, goats, and sheep. Others practiced slash-and-burn farming. This was a very early farming technique. People cleared the land by cutting down and burning trees and the undergrowth. After a few years, the thin soil became exhausted. Then the people moved on to new areas. Experts believe such farming began in Africa sometime around 6000 B.C. Belief Systems and Language Like other ancient peoples, most Africans believed in more than one god, though they usually believed in one creator god greater than the others. They also thought that there were spirits present in animals, plants, or natural forces. This belief that everything possesses a soul is called animism. These early societies did not have a written language. They preserved their history by telling stories. In some places, storytellers known as griots (gree•OHZ) kept the history alive. Their stories were lively retellings of past events. ESSENTIAL QUESTION What role did ironworking play in Nok culture? 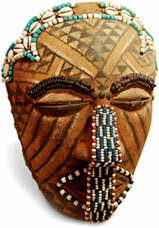 Many early peoples in West Africa made objects out of materials that decayed, such as plant fiber. Few artifacts survived. However, archaeologists have found evidence of one culture that made objects that have survived. Sculpture This Nok sculpture shows a half-human, half-bird creature. Ironworkers Between the Benue and Niger rivers—a distance of about 300 miles—scientists have found small clay statues. In addition, they discovered waste products from ironmaking, charcoal, and iron-smelting furnaces. Archaeologists were surprised to find that iron had been produced in this area before 500 B.C. They had thought, based on previous evidence, that ironmaking occurred only in the eastern part of Africa. One early West African people who produced iron were called the Nok. They lived in an area that today is southeastern Nigeria. It appears that the Nok did not follow the pattern of some early ironmakers in other parts of the world, who first produced copper and then bronze. Instead, the Nok seem to have moved right into ironmaking. They were among the first western African people to make iron. Using Iron To produce iron, the Nok mined iron ore. Then they smelted the iron. Ironsmiths worked the iron into tools and weapons.Some of the tools and weapons made their way into trade routes across West Africa. 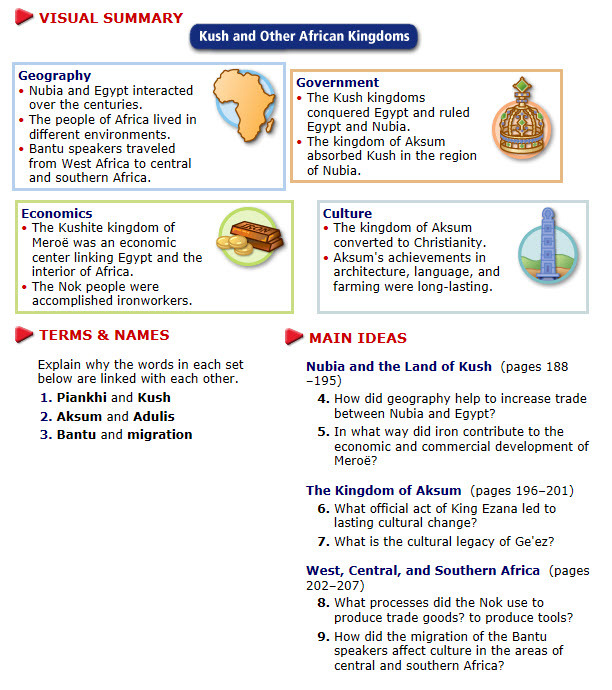 ESSENTIAL QUESTION Where did the Bantu peoples first live, and where did they move to? The Bantu people lived in the same area as the Nok. The Bantu spread across Africa in what was one of the greatest movements in history. They slowly moved south and east along a frontier, opening up new lands to farming and herding. The Bantu brought farming and iron to Africa south of an imaginary line from Nigeria in the west to Kenya in the east. Bantu Speakers Some African peoples spoke similar languages based on a parent language that historians called Bantu. The word Bantu itself means "the people." The Bantu-speaking peoples were not one group. They were many groups who had similar cultures. They were farmers, herders, and eventually ironworkers. 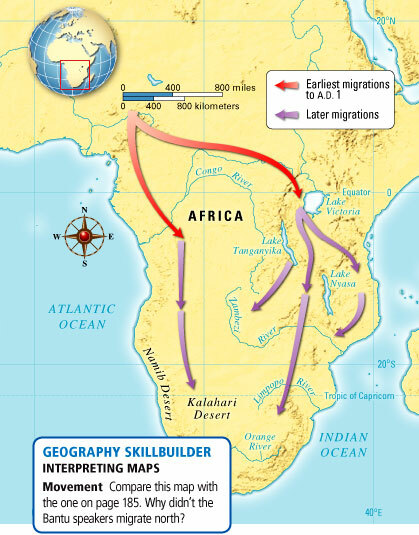 Migration Begins About 3,000 years ago the Bantu speakers began moving out of their lands near the Benue and Niger rivers in West Africa. They migrated south and east. A migration is a move from one region to another. The migration of the Bantu was a slow process that took thousands of years. Some groups eventually settled in the rain forest along the Congo River. Some Bantu lived in small villages and farmed along the riverbanks. Later, Bantu-speaking groups moved south beyond the forest to the grasslands of southern Africa. There they began raising animals such as cattle and growing grain crops. Bantu farmers adapted the way they farmed to their new environments. Bantu speakers kept their ability to make iron. Ironmaking set them apart from others living in areas to which the Bantu migrated. Their iron tools helped them in their main task of farming. Effects of Migration The Bantu speakers moved to areas where other people already lived. The Bantu adopted cattle herding from peoples near present-day Lake Victoria. They displaced hunting-gathering peoples. Bantu speakers exchanged ideas and customs with people in the areas they entered, and intermarried with them. They shared their knowledge of ironmaking and agriculture. As the Bantu speakers migrated, their languages spread. Mask This mask was created by a Kuba craftsperson. The Kuba were a Bantu-speaking people. • Early societies living on the savannah south of the Sahara practiced herding and farming. • The Nok made iron tools for use and for trade. • Migration of Bantu speakers spread the Bantu language and culture. Despite the great variety of languages and cultures in Bantu-speaking Africa, there are also connections based on a common heritage.